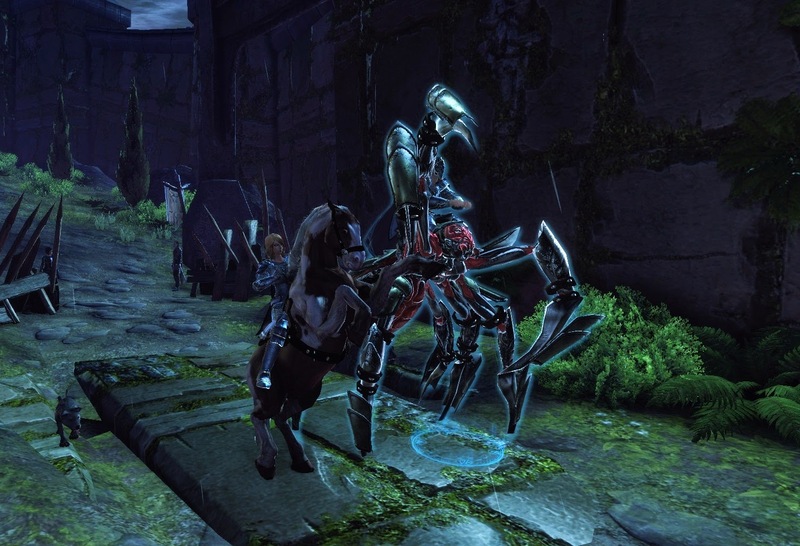 About a year ago I wrote about trying out Neverwinter Online for a while, to get back into a fantasy MMO for a bit. In the end I think I played it for about a month before my interest fizzled out again. The friends that had originally suggested it as a game to play together never actually bothered to group up, and even my pet tank lost interest after we accidentally outlevelled a skirmish and thereby hurt his completionist feelings because now we weren't going to see ALL THE THINGS (yes, this is a thing with him). I continued to log in on my own for a couple of days just to invoke and gained a few more levels that way, but eventually I just... stopped. No hard feelings; I just lost interest. Recently, a couple of my SWTOR guildies have been dabbling in the game again, which led to my pet tank's interest reawakening as well and him suggesting that we should go back and give it another try by rolling up a new pair of characters, following our usual, tried-and-tested tank and healer routine this time. "Why not?" I thought. The game almost immediately provided an answer to that question when I tried to pick up my level four cleric alt and found that her main quest line had been reset due to inactivity (??? ), asking me to redo the instanced starting area, which - as far as I'm aware - had already become inaccessible to me at this point. I fumed with anger for a little while but then decided to just cut my losses, delete and reroll her. It's not as if I was losing much after all; it just seemed like a random and very pointless obstacle to put in my way. My half-elf cleric at level 40. Sadly the different bits of armour you get while levelling up all look more or less identical, but I do appreciate that the gear looks pretty realistic and functional. In general, the game immediately made me appreciate SWTOR's polish. SWTOR has got some minor bugs, sure, but I've only been playing Neverwinter for less than a week now and have already considered keeping a little diary just to keep track of all the random disconnects, instancing issues, group finder bugs and whatever else we've encountered so far, because there've been a considerable amount of them... though fortunately not enough to make the game unplayable. There have also been some improvements compared to when I last played a year ago: for example the game is now much more likely to put group members into the same instance when they transfer maps, something for which I'm eternally grateful considering the frequent zoning required by the game. On the whole, I'm quite enjoying the change of pace. I'm still no fan of action combat, but it certainly makes for a very different experience. The constant dodging of special attacks is quite challening, and as we go up in levels we're finding the dungeon bosses harder and harder. To be honest, as it stands I'm worrying that we might soon find them too hard for our skill level (plus that of our randomly dungeon-findered group mates). The last boss in Throne of Idris wiped us about five times before we got her down, and when we tried to complete the Gray Wolf Den last night, we eventually had to give up after so many wipes because we kept getting injured (which gives you a debuff) and we had run out of injury kits to cure ourselves. Having read up on the boss afterwards, it seems that she spawns extra adds every time someone gets hit by one of her abilities, and since adds running rampant makes it even harder to successfully dodge everything, it's easy for things to spiral out of control very quickly. It's also interesting that even though the game officially has a trinity system, group gameplay doesn't feel very controlled. I'm not sure if that's just a side effect of running with uncoordinated pugs, but Pet Tank keeps complaining that his tanking tools are too limited and I find myself getting swarmed by adds attracted by healing aggro on every major fight. At the same time, clerics aren't even "real" healers in the classic sense, as their direct healing abilities are extremely limited, and most of your healing will come from abilities doing incidental healing while you actually use them to dps. If someone takes a big chunk of damage from standing in bad, you can't really help them; they'll simply have to chug a healing potion. I'm still enjoying it, as I used to love playing support as a shadow priest in WoW's Burning Crusade too, but it certainly took some mental adjustments. Especially at the beginning I found myself getting frustrated a lot, trying to use my one targeted heal on people and always hitting the wrong person since it's extremely hard to stay on target when everyone's constantly running around and dodging things in melee. These new experiences were created by me choosing a different class to level than I did at launch, but other than that the game doesn't seem to have changed much. There were a couple of new low-level quests to introduce us to systems we didn't know about, but I couldn't really tell whether they were actual new additions or just things that simply weren't explained very well back at launch. (I know the scrying orbs definitely weren't around a year ago, but the artefact gear slot? Not sure.) I'm guessing that all the major new content updates have been max-level additions. There's also the possibility that some things just didn't feel that new to me due to reading Telwyn's relatively frequent posts about the game over the last couple of months. I've also come to take another critical look at the game's free-to-play model. On the surface it's very generous and you can play pretty much all the content for free as far as I can tell, but as soon as you go deeper it seems that there are a lot of systems that give significant advantages if you pay with real money, as the alternatives would require literally months of grinding. The companion system is a good example, limiting the basic companions available for in-game currency to being only half as powerful (possibly less) as the highest level ones from the cash shop. Do you need a companion that's that much more powerful? Probably not, but it certainly helps. Same thing with mounts: you can buy a very slow and basic one for in-game gold, but if you want a fast one you either have to shell out some real cash our grind out literally hundreds of thousands of astral diamonds (the "in-between" currency) over the course of weeks and months. Maybe it wouldn't matter much to me if I was only playing with other free players, who are on the same level as me, but Pet Tank bought one of their expensive starter packs at launch, providing him with an epic quality mount and companion on every character, and it certainly feels grating when he charges through groups of mobs ahead of me while I get knocked off and forced into combat because my mount is too slow. Me on my free-to-buy-with-gold horse and pet tank on his monstrous armoured spider mount from the expensive founder's pack. I did end up giving Perfect World some money again, because among other things they had a special offer going on that provided you with a "starter pack" which included a blue quality companion simply for buying cash store currency, while still leaving the actual currency to be spent on something else. However, the whole thing did once again reinforce my overall feeling that I prefer games with a subscription, even if it's optional. A one month sub is a relatively small outlay to get access to everything you need for the duration of your play time, and then you only end up paying more as and if you actually spend more time playing. When instead you have to shell out a bigger lump sum to get access to what I consider pretty basic gameplay features, it's much harder to judge whether that's going to be a good investment in the long run. I was talking to Mish about my healing issues the other day. Browsing through forums, I have discovered that holding ctrl when targeting someone locks you on them no matter how much they run around. Plus, I have adjusted my HUD settings so that now I get health bar of every party member over their head permanently. Makes it easier to track where the person in need of a heal wanders. Yeah, I found both of those tips as well and they do help. :) Sadly, the Ctrl thing still doesn't prevent you from losing your target when the targeted person runs behind another party member. The most efficient and powerful heals are the area heals, the single target heal never scales that well and while good for duo sessions is generally a waste of cooldowns if you're in a larger group (dungeon/skirmish). I love the sunburst aoe damage/heal - actually most 'heals' in Neverwinter do some holy damage to opponents as well. That's something to bear in mind as you can easily grab a lot of aggro if you fire of several encounters in a row. 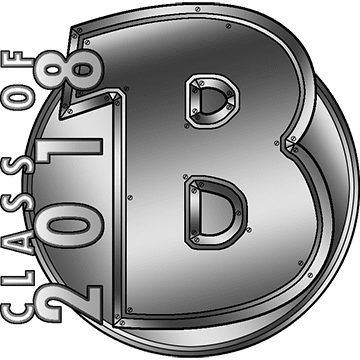 The support aspect of the cleric class is very important as well as there are several powers, and several talents, that expand on the "buff your allies" utility of your abilities. There are some nice damage shields as well including one of the dailies. I think what gives me the most trouble in regards to dodging things in Neverwinter is that while most of your abilities are officially instant, they root you in place while your character goes through the casting animation, which makes it hard for me to judge when I can move and when I can't. Most of the time I find that using the dodge move is the only way to safely escape from a red circle... just to find that now an add has placed one right on the spot I just dodged into, and I have no stamina left to escape from that. I just makes me feel cheated, lol. I should also have added that I agree that SWTOR's engine is generally solider and feels more polished. That said we've encountered just as many bugged missions in SWTOR as we have in Neverwinter, we only play SWTOR as a trio and that seems to be more problematic than it ever was when I leveled my solo sage character I'll admit. However Neverwinter's engine is a ton 'lighter', it loads so much quicker both to get into the game and to transition between areas (I'd say both games use a similar amount of instancing). The conversation system in SWTOR remains the stand-out winner though, we're not interested in serious endgame in any MMO. But the interactive element of conversations for small-group play in SWTOR is pretty hard to beat. I can believe that you've encountered issues with your group in SWTOR - few people bother to do soloable missions in a group of three or four, so I reckon that a lot of issues with that setup go unreported for a long time. Maybe it's a side effect of being so much more familiar with the game, but I find the bugs I encounter in SWTOR to be a lot more predictable. The stuff I've seen in Neverwinter so far has just been incredibly... random. Like the one time we queued for a skirmish and it put us in a group with a disconnected player who couldn't be removed from the group, and the skirmish event couldn't be started because the lever required to do so was unclickable. When we left and re-queued a bit later, we were put right back into the same scenario. And one evening my pet tank got disconnected and when he tried to log back in he kept being put into an "empty" world with no other players or monsters in it. We eventually had to give up for that evening since no amount of relogging seemed to fix it. I thought for only a couple of days of playing that was some impressive stuff! I really wanted to like Neverwinter, and I even got a character to 60, but it just never felt like that great of a game to me. The animations always seemed a bit off. The quests were extremely humdrum. The character growth had very little interesting choice. It feels like a bunch of disconnected adventure zones, and not a world your character inhabits. Which some people prefer, but me, I like a sense of world. The animations are funny sometimes, but just like the terrible voice-acting on certain NPCs, I find it more amusing than off-putting. And it's definitely not a very world-ly game, what with the loading screens for every building and the small zones. But in my opinion it works as what it is. Pet tank and I agreed that it feels a bit like a hybrid between something like Diablo and a regular MMO. 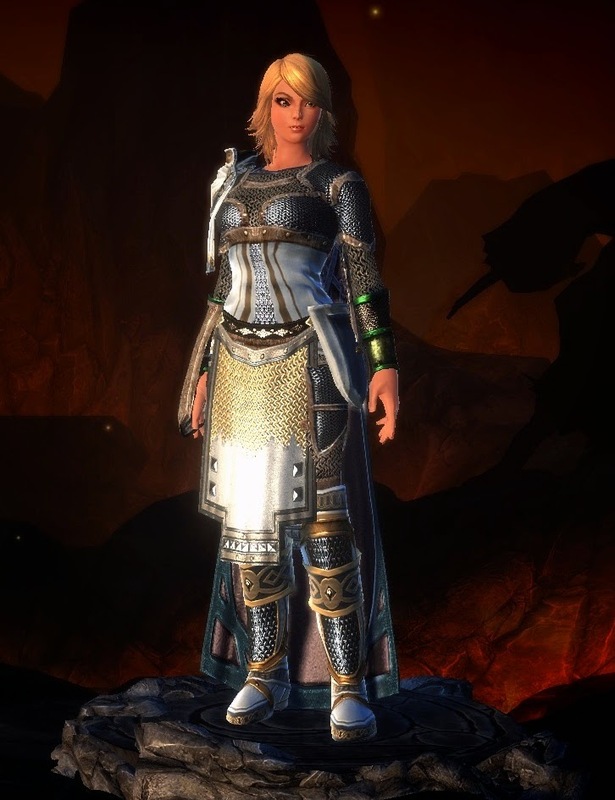 I have to admit I seriously love the Neverwinter armor I've seen. That's a dev team that actually gets it. Aside from the lack of variety, I've been very happy with the looks of my armour. These guys know how to let ladies look seriously armoured. Every now and then you'll get an odd dungeon drop that doesn't go with anything, like a pirate hat from the pirate king, or a wolf pelt from a werewolf boss, but that is at least in line with the whole D&D thing of bosses dropping things that they were actually wearing/using.